With over 20 years of family-run service at our Revere location, Bob’s Auto Body has had the opportunity to give our customers everything they’re looking for when they need cosmetic repair, collision repair, and refinishing. In addition, we have also had the opportunity to give back to the community, as a good neighbor that supports local schools and little league teams, as well as our local police and fire departments. In the early 90’s Bob started Bob’s Auto Body by himself as a one-man shop, and the only difference today is the fact that Bob is now supported by a full experienced team, ready to provide the city of Revere and its surrounding towns with the best possible choice for auto body repair. Over the years, we’ve developed a reputation for excellent work, complimented by the customer service to match. This reputation has allowed us to grow over the years from a small one man shop to a larger, fully equipped facility with expertly trained mechanical, collision, and paint departments. Preferred by Insurance Carriers in the Commonwealth of MA. 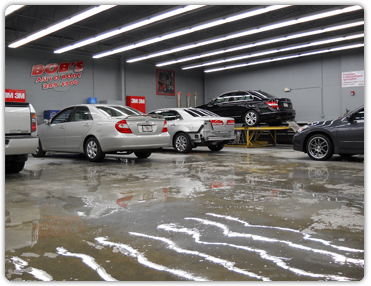 At Bob’s Auto Body, we are committed to excellent repairs and customer service. In addition, we take every step to ensure that we constantly adhere to best practices within our industry. Because of this, we have the privilege of being listed as a preferred provider of auto body repair by a number of insurance carriers, including Hanover, Liberty Mutual, Plymouth Rock, Arbella, and more. If you don't see your provider, don't hesitate to give us a call. Please, don't hesitate to give us a call at (781)-289-1300. Or visit our Testimonials page, to see what our customers are saying about the service they received.